Far-right leader Marine Le Pen's top aide sharply attacked her centrist opponent Emmanuel Macron, who is favorite to beat her for the French presidency, as campaigning for the final round on May 7 got under way within hours of first round results. Global markets reacted with relief to Sunday's outcome which broke a pattern of anti-establishment election shocks in which Britons voted to quit the European Union and Donald Trump was elected U.S. president. 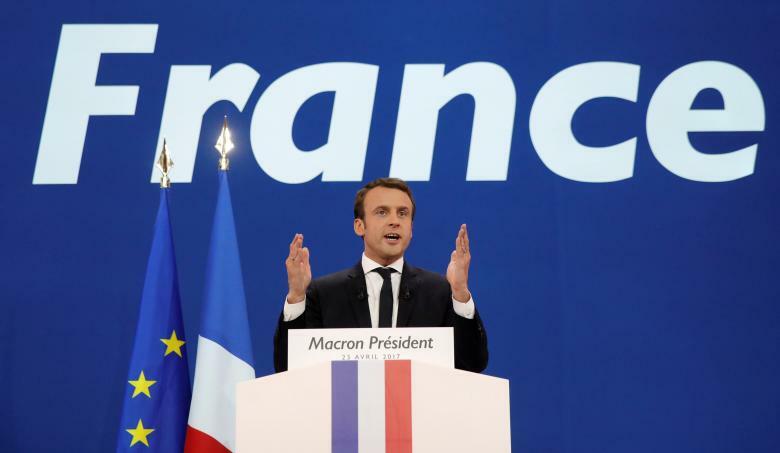 The euro briefly reached five-month peaks while European shares rose sharply on the likelihood that the 39-year-old Macron will win the presidency in the runoff against Le Pen. Her pledge to ditch the euro currency and possibly quit the European Union has unnerved markets. As both sides looked to court support now from their defeated rivals for the crucial May vote, Le Pen's camp took aim at what they see as Macron's weak spots - his privileged banker background and his role as economy minister in a discredited Socialist government of outgoing President Francois Hollande. "Emmanuel is not a patriot. He sold off national companies. He criticized French culture," Florian Philippot, deputy leader of Le Pen's National Front told BFM TV, saying she and Macron held completely different visions of France. Philippot called the independent centrist and former investment banker "arrogant" and said that in Sunday night's speech acclaiming his move into the second round "he was speaking as if he had won already". "That was disdainful towards the French people," Phillipot said. Macron's victory dinner celebrations at Paris's upscale Rotonde restaurant amounted to "bling-bling biz," he said. 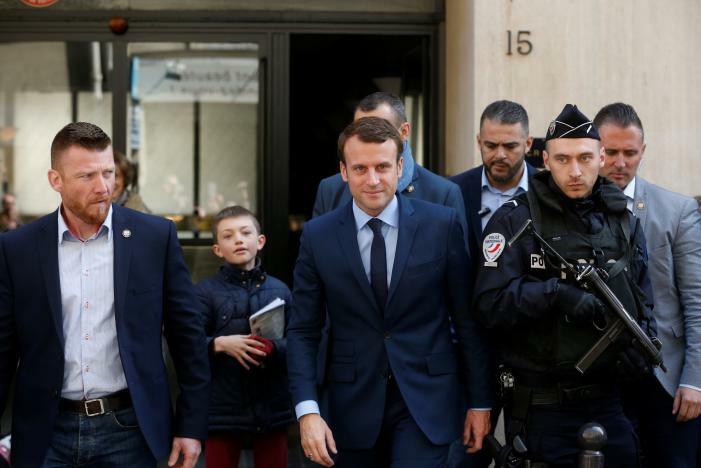 Though Macron, 39, is a comparative political novice who has never held elected office, new opinion polls on Sunday saw him easily winning the final clash against the 48-year-old Le Pen. Interior ministry final figures in the highly-contested first round gave Macron 23.74 percent of the votes against Le Pen's 21.53. A Harris survey saw Macron going on to win the runoff against her by 64 percent to 36. An Ipsos/Sopra Steria poll gave a similar result. Ahead of Sunday's vote, markets had been contemplating a variety of nightmare scenarios for them, including one in which Le Pen would go through to a runoff against the far left's Jean-Luc Melenchon. The communist-backed candidate, who made a late surge in opinion polls, finished in fourth place. 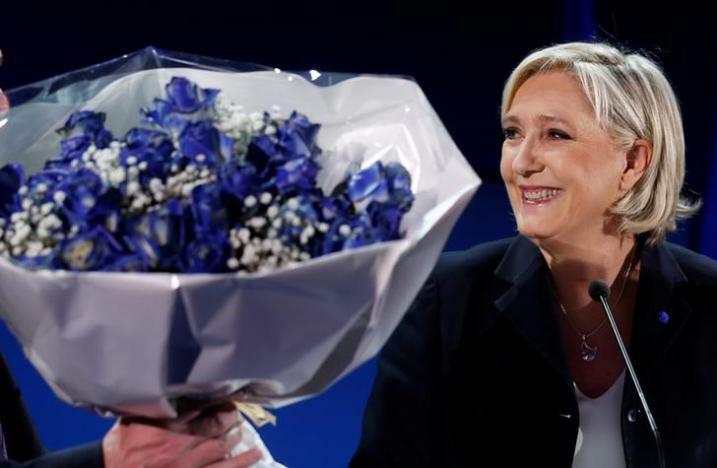 Le Pen will be keen to avoid a repetition of 2002 when her father and National Front founder, Jean-Marie Le Pen, got through to the second round in a surprise vote but went on to lose in a humiliating landslide against right-wing president Jacques Chirac. Analysts say Le Pen's best chance of hauling back Macron's big lead in the polls is to paint him as a part of an elite aloof from ordinary French people and their problems. Part of that strategy would be to remind voters of Macron's former role as a deal-maker in investment banking and economy minister under Hollande. Without waiting for figures from the count, two defeated candidates - conservative Francois Fillon and socialist Benoit Hamon - urged their supporters now to throw their energies into backing Macron to stop any chance of victory by Le Pen, whose anti-immigration and anti-Europe policies they said spelled disaster for France. Melenchon declined to back either of the two. Manuel Valls, a former Socialist prime minister on the right-wing of the party who broke with Hamon's campaign after failing to beat him for the party ticket, said he would be ready to work with Macron. "We must help him (Macron) as much as we can to ensure Le Pen is kept as low down as possible," Valls said on France Inter radio. In a victory speech on Sunday Macron told supporters of his fledgling En Marche! (Onwards!) movement: "In one year, we have changed the face of French politics." He said he would bring in new faces and new talent to transform a stale political system once elected. Sunday's outcome was a huge defeat for the two center-right and center-left groupings that have dominated French politics for 60 years. Fillon, who insisted to his The Republicans party that he would triumph despite damaging allegations that he had paid his wife and two children from the public purse for work they did not do, ended in third place with just short of 20 percent of the vote. Socialist candidate Hamon never managed to gather any real momentum in his campaign and ended up in fifth spot - a position which emphasized the disarray of the French Left after five years of unpopular rule by Hollande.